Happy Valentine’s Day! It’s a day for friends and lovers. The world needs a little more love from the looks of things but I won’t get into that! It has snowed, iced and rained in my region of late and I have to say I am really tired of it even though we have not had a very hard winter. I am so ready for Spring, warm sunshine, flowers, and the good old outdoors! I hope you find the newsletter helpful this month. Please let me know if there is anything in particular that you would like to see covered or if you have a favorite shortcut that you use and would like to share. Please take care of YOU and all the ones you care for and about. This is a really handy shortcut that will quickly display the Tabs dialog box. It’s so simple that all you do is to double-click on your Ruler just below the markings appearing there. Make sure you double-click at the bottom of the ruler, not at the top. If you double-click at the top, the Page Setup dialog will appear. 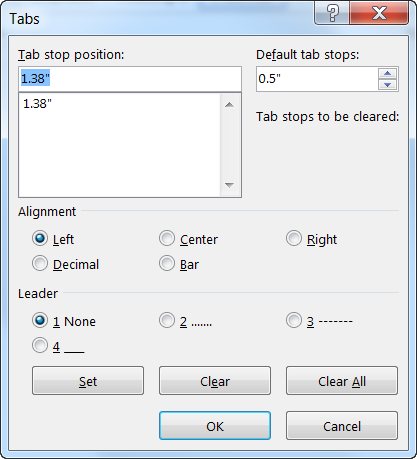 Please note that when you double-click on your Ruler, you may also inadvertently set a tab stop. If you want to delete the newly placed tab stop, you can do so at the Tabs dialog or you can simply drag it off your Ruler. Subscribers: Software that Streamlines your Documents! It is not unheard of to have a document that mixes different column layouts on a single page. For our purposes, we will assume you have a six-page document, and you want to format the center part of page two as three columns. You want the rest of the document to remain a single column. Overcoming this formatting challenge is easy when you use the tools available on the ribbon. Select the text that will appear in your columns. Select the Page Layout tab of your Ribbon. In the Page Setup group, click the Columns drop-down list. Pick the number of columns you would like to use for your selected text. That’s it! Word will do the rest and format the selected text into the number of columns you specified. It does this by automatically placing continuous section breaks both before and after the text you selected in step 1 above and then formatting the text into the number of columns you selected in step 4. above. While you can do the above steps yourself, manually, it is much easier to let Word to do it for you! Suppose you have a table that you do not want to extend past three lines vertically in any given cell. You may wonder if there is a way to lock how many lines there can be in any given cell of a table. Normally the height of a row (which, of course, controls the height of cells in that row) can vary from row to row. Word does this so that whatever you place in the row can be fully accommodated by the table. There may be times when you do not want the row to expand, but instead you want the row to be a specific height. Select your entire table. Position your cursor within your table, and display the Layout tab of your Ribbon, and choose Select Table from the Select pull-down list. Right-click the selected table and then select Table Properties from the Context menu. 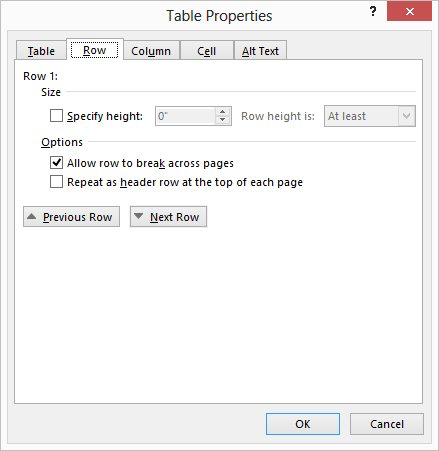 Word will display the Table Properties dialog box. Be certain the Row tab is selected. In the Specify Height box, indicate how high you would like each row. For three lines of 12-point type, you should specify one-half inch. Using the Row Height Is drop-down list, select Exactly. Now your row height will never go above whatever you set in step 4 above. Note that this approach will not stop someone from adding information that requires more than three lines in a table cell; it just will not display anything beyond the first three lines.